DESPAIR cast its dark shadow over the bird population as the evil black winged demon patrolled its domain. With beady yellow eyes it scanned for any hapless feathered intruder that dared trespass into its self proclaimed territory. It had only one mission in life and that was to track, attack, injure and evict any poor unfortunate bird that crossed its imaginary demarcation line. Size did not matter in the least, for although The Intruder was about the size of a magpie, it tackled much larger birds. 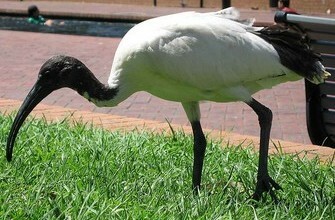 There used to be flock of ibis that had settled in the park next door and often scavenged for food in our grounds. They are a shy and gentle, albeit, awkward looking bird whose company we did enjoy. I well remember one day in particular when, hearing a commotion, I looked across into the park and there was The Intruder attacking an Ibis. It looked so strange to see this nasty little black avenger having a go at this big white placid bird. The Intruder was in attack mode but the poor ibis, not being aggressive by nature, was defenceless against his onslaught. All of a sudden the ibis opened its long curved beak and let out a squawk of pain as it was struck by the intruder causing it to fly off in fright. The ibis made a couple of brief visits after that but then they disappeared. That was over three months ago, sadly, to this day there have been no more visits from this meek but amiable bird. 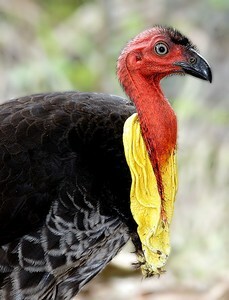 There is also a family of scrub turkeys that have their nest mound beside Petrie Creek that runs through the park. Although they were as large or larger than the ibis, they were just as vulnerable to attack as any other bird, copping a hiding every time they ventured too close to the imaginary boundary, but they remain in residence here, mainly because they have their permanent nest down by the creek. Not only had the dark curtain of despair fallen across the land but silence also. The resident birds that were so prolific before, were absent from the surrounding trees and the air was devoid of birdsong, except when occasionally the song of a butcher bird or a magpie’s warble could be heard floating in on the breeze from far off in the distance as they sang in the treetops safely outside the despots territory. Posted on September 29, 2011, in Natures Pecking Order and tagged Mother Nature, Wild Things. Bookmark the permalink. Leave a comment.